We are witnessing the instrumentation of every available surface in the material world—streets, cars, factories, power grids, ice caps, satellites, clothing, phones, microwaves, milk containers, planets, human bodies. Industry experts estimate that there will be more than 30 billion connected IoT devices by 2020. These devices will generate more data than we have ever experienced. This data is streaming in real time and will force companies to determine which IoT Data Platform architecture will be resilient, scalable, and extensible enough to handle these new workloads. Tracking battery performance, turbine production, package delivery status and generally visually monitoring sensor data provides incredible capabilities to the business and their customers. This is usually the first step in any successful IoT project. Using historical data from sensors to gain insights that can be applied to the current situation creates a major competitive advantage. Predictive maintenance, optimized traffic routing, reduced churn management, and enhanced water conservation are all possible with IoT analytics. With the speed and velocity of events being generated by sensors, businesses want to act on this data in real-time with no human interaction. For example, automatically shutting down a pump if a leak is detected, or changing wind turbine direction based on wind speed all create an immediate business advantage. IoT is synonymous with time-stamped data, or time series data since the purpose of any sensor is to measure change over time. To gain insight and act, systems need to evaluate and analyze the data based on timeframes and ranges. The Modern IoT Data Platform needs to be optimized for time series data. IoT is synonymous with streaming data. Data is created by a myriad of sensors, and each sensor emits a relentless stream of data. The Modern IoT Data Platform needs to be optimized for streaming data and has actionable analytics to find the signal from all the noise. Sensors capture and emit data in real time. Greater business value is derived if the data can also be interpreted and acted upon in real time. The Modern IoT Data Platform is designed to handle real-time ingestion and real-time streaming analytics. 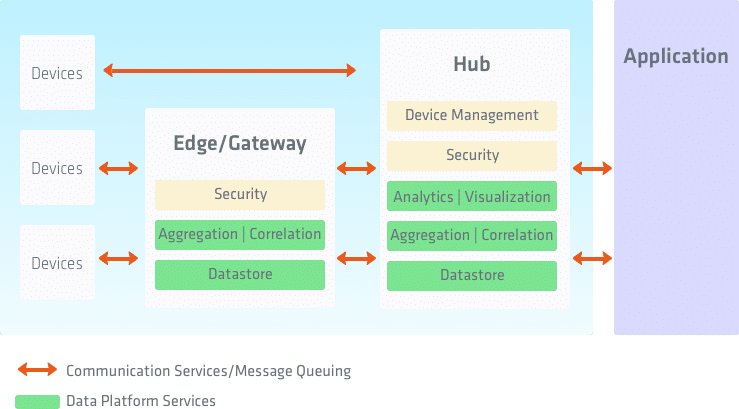 There is the need for a modern IoT Data Platform which provides a comprehensive set of tools and services that are optimized for IoT data and can provide the tools needed to meet the business requirements of monitoring, analytics, and control. We have many customers using InfluxData as an integral part of their IoT architecture, using our Modern Time Series Platform as their IoT Data Platform. Some Featured IoT Data Platform Use Cases are listed below, or browse all our InfluxData customer testimonials. tado uses InfluxCloud to provide analytics from its hundreds of thousands of sensors units across the globe. They use this data to power their smartphone apps helping customers understand energy usage and generate energy savings. Spiio chose InfluxData to be its IoT Data Platform. Spiio uses sensors to understand plant performance for optimal green wall growth and maintenance from data. InfluxData provided the scalability and ease of use needed for fast deployment. BBOXX uses InfluxData as its IoT Data Platform, to continuously monitor their geographically dispersed 85,000 solar units. They use this data to provide predictive maintenance and are becoming a data-driven organization. At the heart of the InfluxData offering is InfluxDB, an open source Time Series Database that supports high write loads, large data set storage, and conserves space through downsampling, automatically expiring and deleting unwanted data as well as backup and restore. InfluxDB also makes it easy to analyze data by providing an easy-to-use SQL-like query language. According to DB-Engines, InfluxDB is the leading Time Series Database. InfluxData provides a comprehensive set of tools and services to get metrics and events data from sensors, devices, systems, and machines. InfluxData’s collection services are built from the open source Telegraf project. In addition, InfluxData provides services to normalize, correlate, and aggregate this data by using services from the open source Kapacitor project. InfluxData uses the services from the open source project Kapacitor as a native data processing engine. It can process both streaming data or batch data from the data store. Kapacitor lets you plug in your own custom logic, User-Defined Functions (UDFs), or machine learning libraries, to process the data and create alerts with dynamic thresholds, perform pattern matching, compute statistical anomalies, etc. that can then trigger UDFs to form the basis of your IoT control plane. InfluxData allows for the graphical real-time visualization of data with the open source project Chronograf, and performs ad hoc exploration of your data. Chronograf includes support for templates and a library of intelligent, pre-configured dashboards for common data sets. The IoT Data Platform fits within the broader IoT platform by providing just the data services. InfluxData has a number of partners that provide the other IoT Platform services. The necessary services that provide device connectivity, message/event queuing and transportation services across Wi-Fi, cellular and fixed connections. A set of security services that provide encryption and authentication services to ensure that devices (and software on the devices) are secure and tamper-proof; also usually required are additional services that provide security to the communication services. Services that support devices’ provisioning and lifecycle management. Key set of data services that support collection, aggregation, storage, visualization and analytics of the sensor data.